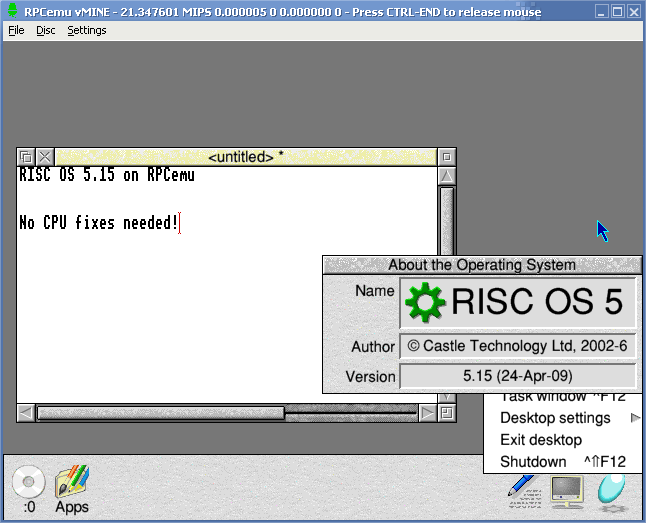 Tom Walker has been busy - the new experimental RISC OS Open 5.15 ROM for IOMD-chipset computers (RiscPCs and A7000s) can work on open source emulator RPCEmu, as this screenshot shows. Follow the development discussion here and source code changes here. For anyone wanting to try out the ROM on a physical RiscPC, you'll need to remove your VRAM expansion, if present, and modify the 'Ask' utility in the download to (i) ensure that you have CLib 5.46(?) or later loaded before invoking 'SoftLoad' and (ii) use the filename of the actual ROM image downloaded from the site. After that, my findings are pretty much the same as Tom's...that you can boot to the desktop (although I've not got the mouse working yet), with 8MB DRAM recognised/used, but hardware scrolling is not working, probably because Tungsten doesn't actually use 'true' hardware scrolling, and I'm guessing the previous code is either broken or not properly reinstated. Did you find the same problems with !Draw and !Help - that they contain ARMv5 instructions, and promptly crash? Just want to check it's their bug and not mine. Mouse - I had to reconfigure the mouse every time I booted the OS. I have a feeling that PS/2 mice are the only ones supported, and hence you won't be able to use it on a RiscPC. Tom, was going to mail the list with this, but I'll post here too, and possibly stick it on ROOL forum too. "The sources have acquired a light sprinkling of ARMv4 instructions like UMULL, in SpriteExtend for one, which means they won’t work properly as-is on pre-StrongARM machines." It looks like there's also some ARMv5 in there too as you found. Which is something ROOL will have to fix for real hardware. "Known issues include: CMOS appears to be reset on every boot"
It also looks from the commit messages that this has very much been developed on an A7000, as such I also wouldn't expect Quadrature mouse yet. And it looks to have a fairly hard-coded memory map, which could be the 8MB only you found? Yes, this all looks about right. It all looks to be hard-coded for a specific machine - which is all they needed for initial development and to show off at Wakefield. I'd guess that it might be better for real hardware if they emulate the new ARMv5 instructions (I think CLZ is the only one likely to be used) so that Iyonix application software can still work - though there's no reason these instructions can't be implemented in RPCemu. At the Wakefield show ROOL did say that 5.15 does not work on a real RPC yet, only on an A7000. rjek did a little module which trapped and emulated some ARMv5 instructions such as CLZ on older machines, to allow Firefox 2 to work on the RPC. I did get the mouse working....you need *Configure MouseType 0 for quadrature (I didn't recall the correct number at the time). Also noticed the 8MB + 0MB VRAM limitation, which is quite possibly a quick kludge for bring up. The CLZ instructions are readily apparent looking through the ROM image; a quick perusal revealed nothing more, though I may have missed something else by rejecting it as data. Ah so I modify the Ask utility to get rid of the CLib error. I've posted to the RPCemu mailing list but I'll also say it here: we build the wrong (Iyonix to be precise) version of the FPEmulator into the A7000 ROM image so that is the main cause of crashes. We'll be posting a fixed build with the correct FPE on our web site very soon. Right, the new A7000/RiscPC build is up on our site - hopefully it will be a bit more stable. Note: it's still very much a work in progress! Page generated in 0.1325 seconds.